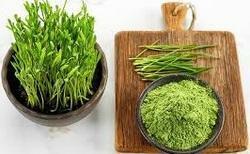 · We are renowned Manufacturer, Supplier and trader of excellent quality Wheat Grass Powder. The Powder we make available is a 100% nutritious food supplement. We ensure that it reaches the buyers in air tight and moisture proof packaging options. Owing to our brilliant logistics network, we are capable of delivering bulk orders of it within the promised time frame. One can obtain it at nominal rates from us. · Wheatgrass is a good source of potassium, a very good source of dietary fiber, vitamin A, vitamin C, vitamin E (alpha tocopherol), vitamin K, thiamin, riboflavin, niacin, vitamin B6, pantothenic acid, iron, zinc, copper, manganese and selenium, and has negligible amount of protein (less than one gram per 28 grams). Adding other foods with complementary amino acid profiles to this food may yield a more complete protein source and improve the quality of some types of restrictive diets. Established in the year 2017, we Ignitive Impex Private Limited is engaged in Exporter, Trader and Manufacturer of Ground Spices Powder, Nuts and Oil Seeds, Dehydrated Veg, Moringa Oleifera Products etc. Under the guidance of expert professionals, the offered range is processed with perfection in adherence to the food industry set guidelines. Owing to our packaging facility, we are committed to dispatching the offered products safely at the customers' premises.